Tear stains are most noticeable on light-haired kitties. When your kitty's eyes regularly overflow with tears, the moisture leads to the unsightly staining of her facial fur. After bringing Fluffy to the vet to determine the cause of her teary eyes, groom her pretty face regularly to help remove tear stains and prevent new ones from forming. Fluffy doesn't cry because she's sad, rather her eyes can become excessively teary for a number of reasons, many of which require medical attention. Your vet can tell you what is causing your feline friend's excess tearing, technically known as epiphora, and possibly cure it. Causes for epiphora include eye infections, injuries to the eye, blocked tear ducts, allergies, rhinitis, corneal ulcers or glaucoma, according to petMD. Some kitties may experience irritation from their improperly formed eyelashes. Your vet can determine a course of treatment for your feline friend. He also may perform surgery to correct problems with eyelashes or open blocked tear ducts to prevent issues with staining. Unfortunately, some kitties have a genetic predisposition to developing tear stains because of their facial structure. Flat-faced breeds such as Persians and Himalayans are most prone to these types of issues due to improper tear drainage from their nasolacrimal ducts, according to WebMD. If this is the case, clean your kitty's eyes with separate cotton balls dipped in warm water or a sterile saline solution twice a day. This will gently clean away stains and prevent new ones from forming by removing tears from the area, which oxidize, leading to reddish-brown staining. Gentle cleaning of the eye area also eliminates bacteria from around the eyes, which contribute to staining and flourish in the dampness caused by the excess tears. Some tear stains are stubborn and difficult to remove. If this is the case, you may need to have your vet or groomer trim the hair around your kitty's eyes to remove the stained fur. 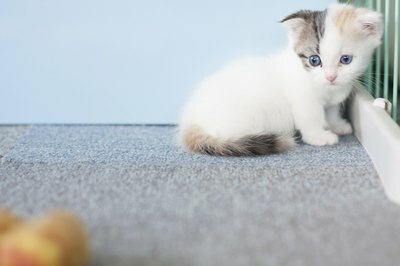 Trimming also prevents new stains from forming by eliminating the fur that is constantly becoming saturated with moisture and it can stop stray hairs from irritating your kitty's corneas. You also can clean away hard-to-remove stains using pre-moistened pet wipes containing antibacterial cleansing ingredients such as acetic and boric acids, recommends VCA Animal Hospitals. Take care not to get the cleansers directly in your kitty's sensitive eyes, which can irritate them. While some feline dietary supplements help prevent tear staining in cats, many of them contain low doses of antibiotics. Antibiotics, including doxycycline, tetracycline, metronidazole and tylosin, do help deter tear stains by killing any bacteria or yeast that can contribute to them, according to VCA Animal Hospitals. Unfortunately, regular use of antibiotic-containing supplements can lead to antibiotic resistance in your feline friend, and are thus no longer recommended by vets. Instead, use supplements containing ingredients like parsley, cranberry extract, vitamin C or probiotics, which may help to prevent tear stains safely. In addition, a daily application of petroleum jelly around the eyes can prevent the fur around the eyes from getting saturated with tears and becoming stained. Do Tears on Yorkies Have Anything to Do With the Food They Eat? What Causes a Teacup Poodle's Eyes to Tear & Stain Its Fur?